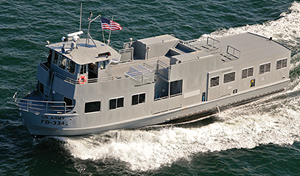 Wa rren, RI (June 9, 2012) – Blount Boats, Inc. has designed and completed four (4) 75-foot passenger vessels for the U.S. Army for service to the Kwajalein Atoll in the South Pacific. 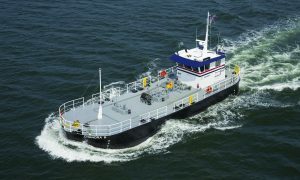 The vessels were built to meet the USCG Subchapter “T” for operation between the Marshall Islands of Kwajalein, Rio-Namur and Ennubirr Island on a Protected Waters Route for the Kwajalein Range Service, LLC, a contractor to the U.S. Army. The 150-passenger mono hull boats are constructed of welded Corten steel with aluminum superstructure. The ferries are powered by twin Detroit Series 60 diesel engines, rated at 475 hp at 1,800 rpm, coupled to ZF 550 1.833:1 ratio gears. The vessels were designed to operate efficiently and with minimum maintenance. The fire and bilge pumps are PTO driven off both mains, and the steering will be operated by a cable-type steering system reducing the need for generators. All four vessels were successfully delivered on Saturday, June 9th via commercial transport vessel contracted by the U.S. Army. 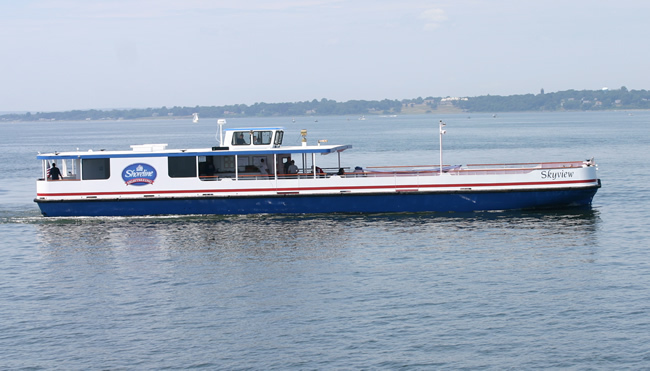 Warren, RI (July 24, 2012) – The 89-foot steel excursion boat, LILA built by Blount Boats for Wendella Sightseeing Company was accepted and delivered FOB Warren on Tuesday, July 24th. The vessel arrived in Chicago via the Erie Canal on August 1st. The LILA was designed by Timothy Graul of Timothy Graul Marine Design of Sturgeon Bay, Wisconsin. It is powered by twin screw Caterpillar engines and will accommodate up to 340 passengers for architectural tours on the Chicago River. The vessel was designed with a climate controlled main cabin and will be outfitted with bar, heads and an entertainment & security system. The new vessel is certificated by the U.S. Coast Guard under Subchapter “K” for lakes, bays and sounds less than 1 mile from shore. The M/V LILA is the sister vessel to the M/V WENDELLA built at the Blount shipyard in 2007, and the M/V LINNEA built in 2010. The LILA marks the 337th vessel to be built by the Blount shipyard, which has been in continuous operation since 1949. Wendella Sightseeing is a Chicago family owned and operated business entering its’ 78th season as one of Chicago’s premier sightseeing and tourism venues. Founded in 1935 by Albert Borgstrom, a Swedish immigrant, Wendella is now in its third generation with Michael Borgstom serving as President. Warren, R.I. (September 20, 2013) – Blount Boats completed the 85’ FIRE ISLANDER in September of 2013. 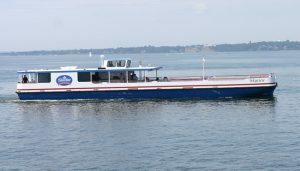 The 382-passenger, 2 deck, all aluminum commuter boat will operate between Bay Shore Long Island and Fire Island on Great South Bay, Long Island, New York. The triple screw vessel is powered by Detroit Series 60 Tier II diesel engines, 600 hp each at 2,100 rpm with 2:1 ZF 550 reduction gears. At a displacement of 43.6 tons, she cruises at 19 knots at 70% of her horse power load at full complement and 24 knots lightship at wide open throttle with very little wake. This Blount water bus is DC powered with PTO driven fire and bilge pumps and stainless steel cable steering to large quadrants in the steering compartment, custom built sheaves and reduction gear sprockets enable single handed steering. The two outboard engines are plumbed to a heat recovery system that supplies hot water to several Heater Craft heaters so that this vessel can be used in the winter months. Two banks of three in-line Duramax keel coolers are strategically placed for engine cooling that allows for less drag and optimum speed. The FIRE ISLANDER has been built and certified under U.S. Coast Guard, subchapter K Rules and Regulations. 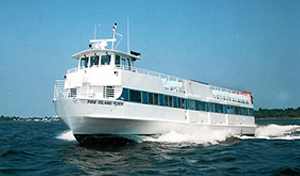 She was based on the original design of the Firebird, built by the Blount shipyard for West Ferry, Inc., a sister corporation of Fire Island Ferries in 1984. The relationship with the Blount shipyard dates back to 1971 when Ed Mooney first met Luther Blount to have him build the Capt. Patterson, a 300 passenger, steel hull ferry for Fire Island Ferries. The new Fire Islander represents the ninth vessel built by Blount Boats for the Fire Island Ferries fleet since 1972. 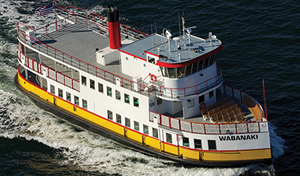 Blount Boats & Shipyard, located in Warren, RI, recently completed the 110-foot passenger ferry WABANAKI contracted by the State of Maine Department of Transportation for the Casco Bay Island Transit District. The design specifications were developed by Rolls-Royce for the 399 passenger US Coast Guard Sub-Chapter K vessel that will operate year round ferry service to six islands in Casco Bay, Portland, Maine. The vessel is equipped with (2) electronically controlled Caterpillar C-18 Tier II diesel engines that meet the latest EPA standards, complete with (2) Twin Disc MGX-516 Marine Gears and ZF Mathers engine controls and shaft brake systems. 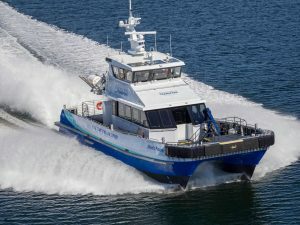 Additional features include a 50HP Wesmar Electric Bow Thruster System, (6) Mathers control stations, a 400,000 BTU Burnham Boiler, a Jastram Electro-Hydraulic Steering System with controls for six stations and a 2000 pound capacity passenger/light freight elevator to meet latest ADA regulations. Other features include (2) ADA compliant bathrooms, recycled lumber seating throughout the vessel, vintage style rounded stern and functioning stack. Blount Boats is pleased to announce that the Wabanaki, hull #335 will mark the eighth vessel built for the Casco Bay Island Transit District. Over the last 57 years, the Blount shipyard has built a total of seven vessels for Casco Bay: AUCOCISCO II (1953), EMITA II (1953), ABENAKI (1963), ISLAND HOLIDAY (1967), ISLAND ADVENTURE (1968), ISLAND ROMANCE (1973), and MACHIGONNE (1987).